Homeowners use numerous chemical compounds to improve and maintain their lawns. When used properly, most of these chemicals have a tolerable impact to humans, pets, and the environment. However, there are several lawn care chemicals that can present significant health and ecological effects that homeowners should be aware of to reduce dangers to themselves and the local community. This guide is intended to inform homeowners of known or potential hazards based on data collected from published scientific studies, regulatory organizations, and manufacturers. Sources are cited and can be found at the bottom of the page for further reading. Hazard ratings are based on the potential acute and long-term impact to humans and the environment based on the presence of evidentiary information from credible sources. The reason(s) for these ratings are listed for reference. The Environmental Protection Agency (EPA) along with other federal and state government organizations manage proper labeling practices for pesticides and other hazardous materials. These regulations were originally founded to protect professional workers and inform them of proper use, hazardous chemicals, and adequate levels of protection. Information about products including composition, acute dangers, toxicity, and others can be found by searching for the product name + “SDS” in Google. A safety data sheet (SDS) is required for any product containing hazardous materials and are widely available online, or at the point of sale (ex. Home Depot). Conduct additional research about pesticides via these scientific and regulatory links. The EPA and other regulatory organizations work to understand and categorize the health and environmental risks of all hazardous chemicals. When considering the human health impact of a pesticide the EPA will focus on exposure, dosages, and the various routes of entry. Understandably, a large amount of their focus is on the impact of repeated (chronic) exposures on workers.The typical homeowner will have a much lower exposure frequency to these chemicals which can make a substantial difference in outcomes. It’s worth noting that the current status of chemicals is subject to change, and the vast majority of studies focus on the effects of substances by themselves. Chemicals often have altered behaviors when they are combined with others. A chemical may be toxic at 100mg/kg by itself, but may be lethal at the same dosage if it is combined with other chemicals. Likewise, the inverse is possible as well. Basic granular fertilizers are relatively safe for humans to use and handle. Granular fertilizers that also contain “weed control” herbicides for undesired plants require a bit more precaution as many of the added chemicals are hazardous or toxic. Inorganic fertilizers do present a substantial risk to the environment if used improperly, and indirectly to humans as well. Impact to environment and humans post-use, specifically the effects of runoff and ground-water contamination on humans and the regional ecosystem. Presence of hazardous chemicals in many consumer products. Urea, Methylurea, Ammonium Sulfate, Potassium Sulfate, etc. Most residential lawn fertilizers are rated using the NPK system. The term “NPK” is simply a combination of nitrogen (N), phosphorus (P), and potassium (K) elemental ids. The label allows for quick identification of the fertilizer’s chemical composition, expressed as a ratio by weight/mass using the format below. The majority of residential fertilizers are high in nitrogen, which is an important building block for chlorophyll, amino acids, and other vital components of plants. Fertilizers marketed as “starter” mixes will contain substantially more phosphorus to aid root development. These elements are also useful to algae. Be aware of added chemicals on fertilizers with additional features like pest-control, weed control, etc. An excess of nitrogen and phosphorus feed algae and lead to an overgrowth event known as a “bloom.” Certain types of algae can lead to toxic water conditions for fish known as a “red tide” or “brown tide” depending on the algae type. In extreme cases, the algae can completely overwhelm the aquatic ecosystem and cause a dead zone due to a lack of available oxygen. Bifenthrin is a botanical insecticide used in many lawn care products. It acts on the nervous system and causes paralysis in common pests such as fire ants. It is rated as very highly toxic to fish and aquatic life by the EPA, so precaution should be taken to avoid runoff and minimize usage of the product if insects are not a problem. Indaziflam controls weeds by inhibiting cellulose biosynthesis. Indaziflam and its metabolite fluoroethyldiaminotriazine (FDAT) have a similar chemical structure to other -azine chemicals, such as atrazine above, but the EPA believes they are sufficiently dissimilar to group together. Overall, indaziflam appears to be one of the safer herbicides on the market to both humans and the environment. It did show a unique toxicity to dogs, particularly affecting their nervous system when chronically exposed through the skin (Eigenberg, 2008) or diet. (Jensen, 2007) Take care to not overuse this product on lawns where dogs reside to reduce exposure, or consider a safer alternative. Indaziflam is also known by the trade names Marengo and Specticle. Penoxsulam has a relatively low toxicity across the board compared to other herbicides. Testing did reveal a propensity for dogs and female rats to develop stones in the bladder which caused urinary tract damage, but only through chronic exposure to elevated dosages. The EPA may conduct further testing to analyze its effects on the endocrine system. Dicamba is a selective herbicide in the benzoic acid family used to control broadleaf lawn weeds. In testing it was shown to be severely irritating and corrosive to eye tissue in rabbits regardless of being washed or not. (Thompson, 1984) While the amount of dicamba is very low compared to agricultural usage, precaution should be taken to avoid getting any of it in the eyes, mouth, or throat. Roundup was developed by Monsanto and sold as a herbicide for consumers and agriculture. 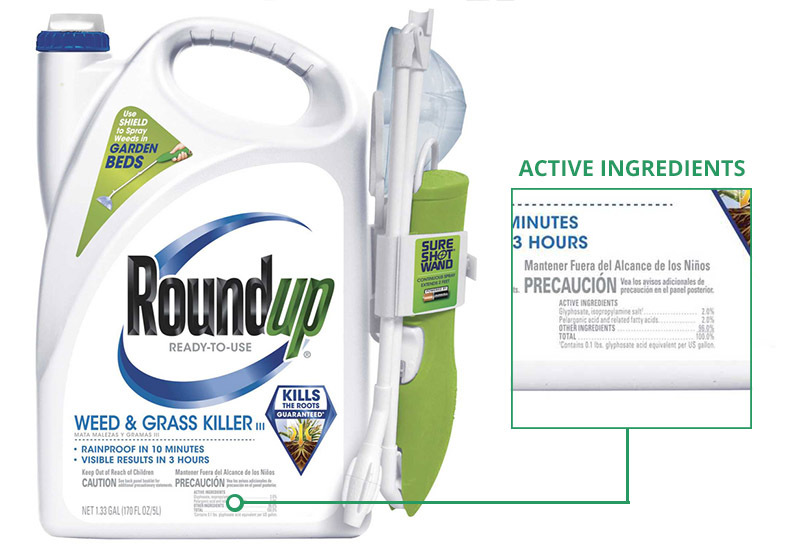 Roundup’s main ingredient, glyphosate, breaks down into aminomethylphosphonic acid (AMPA), methylphosphonic acid, and carbon dioxide. Roundup Extended Control is a long-action herbicide meant to prevent unwanted plant growth in targeted areas. Glyphosate was developed by Monsanto and sold as a herbicide for consumers and agriculture. Roundup’s main ingredient, glyphosate, breaks down into aminomethylphosphonic acid (AMPA), methylphosphonic acid, and carbon dioxide. Imidazolinone herbicides like Imazapic are selective and potent herbicides used to control a wide spectrum of broad-leafed weeds and grasses in a variety of crops, including soybean, alfalfa, wheat, and barley, and in non-crop situations. Imazapic has not been well researched at the time of this article, but has not shown indications of being carcinogenic or severely toxic. Rated Group 2A as “probably carcinogenic” based on evidence that Roundup may be linked to B-cell lymphoma in occupational exposure according to the WHO IARC (IARC, 2015), and early evidence Roundup in its final formulation may be toxic. (Mesnage et. Al, 2014) Risks of acute symptoms due to addition of diquat dibromide. Roundup Max Control is a concentrated, long-action herbicide meant to prevent plant growth in targeted areas. Imidazolinone herbicides like Imazapic are selective and potent herbicides used to control a wide spectrum of broad-leafed weeds and grasses in a variety of crops, including soybean, alfalfa, wheat, and barley, and in non-crop situations. Glyphosate was developed by Monsanto and sold as a herbicide for consumers and agriculture. Roundup’s main ingredient, glyphosate, breaks down into aminomethylphosphonic acid (AMPA), methylphosphonic acid, and carbon dioxide. Diquat is a contact herbicide that produces desiccation and defoliation. Diquat dibromide has not shown indications of being carcinogenic, but it does have the potential for acute symptoms if inhaled including irritation of the mouth, throat, and lungs, cough, and chest pain. Long exposures to concentrated, liquid diquat dibromide can cause chemical burns to skin. (Manoguerra, 1990) Symptoms from overdoses of diquat dibromide range in severity and consistency. Isoxaben classified as “C - Possible Human Carcinogen” due to a statistically significant, increased incidence of benign liver tumors in animal testing. (EPA OPP, 1989) Dicamba also has been found to be a “DNA damage agent” (Gonzalez NV et al, 2006) due to its effects on DNA in peer-reviewed studies. In animals, chlorophenoxy compounds have been shown to demyelinate peripheral nerves, depress ribonuclease synthesis, uncouple oxidative phosphorylation, and increase hepatic peroxisomes. They are also moderately irritating to skin and mucous membranes. Dicamba has been found to be a “DNA damage agent” (Gonzalez NV et al, 2006) due to its effects on DNA in peer-reviewed studies. Mecoprop-p and 2,4-D are both chlorophenoxy compounds which have shown to cause nervous system damage in animal testing. The product is a mixture of several active ingredients including chlorophenoxy compounds 2,4-D and Mecoprop-p, and the benzoic acid compound Dicamba. All of these chemicals are active herbicides and combined to provide a broader effectiveness on weeds. The product is a mixture of two main insecticides belonging to the neonicotinoid family. It targets pests that commonly attack trees and shrubs. The active ingredients are relatively safe compared to many other chemicals found in lawn care due to the mechanism of action. Daconil is a broad-spectrum fungicide to control leaf spots, rust, blights, fruit rots, mildews, scab, molds on vegetables, fruits, roses, shrubs, trees and ornamentals. It’s active ingredient, chlorothalonil, was first registered in 1966 for usage on turfgrass. The active ingredient, chlorothalonil, has been rated by the International Agency for Research on Cancer (IARC) and EPA as a possible carcinogen due to animal testing results. Chlorothalonil is extremely toxic to fish and aquatic life, care should be taken to avoid spraying it before large rainfall events or excessive lawn watering. Manure contains a number of pathogens that can cause significant illness through contact and exposure to runoff. Organic fertilizers such as animal manure have been used for thousands of years to return nutrients to fields and improve crop yields. They also can present issues due to the amount of bacteria present. Rainwater and excess watering of manure laden ground can have a significant effect on waterways and the animals supported by those waterways due to the presence of pathogens such as E. coli. and coliforms. Composting is a great way to recycle household organic waste back into your lawn or garden. However, it also can become a factory for harmful bacteria if conditions are not optimal. The chemicals used in agriculture often start as strong acids or bases. These reagents are combined in a neutralization reaction to provide a much safer end product with a wider range of attributes: a salt. An easy example is turning sodium hydroxide and hydrochloric acid (two strong, hazardous liquids) into common table salt, heat, and water. Since table salt (NaCl) is soluble in water, it will dissolve into ionic elements (anions / cations). These ions will then interact with other elements to create molecules and perpetuate the chemical cycles that benefit plants such as the nitrogen cycle. Water present in the soil and additional water from watering or rainfall will activate this process. It takes substantial effort, time, and funding to properly study the short-term and long-term effects of a single chemical. Those single chemicals may act differently when combined with other chemicals and sold as a product. Furthermore, lab environments are purposely controlled to limit complexity and improve confidence in the results. Real world outcomes are often different due to the introduction of varied conditions. As such, it’s always a good habit to treat any material as if it were hazardous and wear basic protective equipment to prevent exposure. Eigenberg, D. (2008) A One Year Toxicity Feeding Study in the Beagle Dog with Technical Grade BCS-AA10717. Project Number: M/303526/01/1, 201740, 06/C76/FY. Unpublished study prepared by Bayer CropScience LP. 973 p.
Jensen, T. (2007) A Homogeneity and Stability Study of AE 1170437 Technical in Canine Ration. Project Number: M/293734/01/1, 201738, 06/H76/GO. Unpublished study prepared by Bayer CropScience LP. 24 p.
Hart, Murray & Quin, Bert & Long Nguyen, M. (2004). Phosphorus Runoff from Agricultural Land and Direct Fertilizer Effects. Journal of environmental quality. 33. 1954-72. 10.2134/jeq2004.1954. Zhao M, Zhang Y, Zhuang S, Zhang Q, Lu C, Liu W (2014). Environ Sci Technol. 2014 Jul 15;48(14):8109-16. doi: 10.1021/es501903b. Drinking-water herbicide exposure in Indiana and prevalence of small-for-gestational-age and preterm delivery. Health Perspect. 2009 Oct;117(10):1619-24. doi: 10.1289/ehp.0900784. Epub 2009 Jul 31. Bianchi J, Cabral-de-Mello DC, Marin-Morales MA (2015) Ecotoxicol Environ Saf. 2015 Oct;120:174-83. doi: 10.1016/j.ecoenv.2015.05.040. Epub 2015 Jun 12. J Toxicol Clin Toxicol. 1990;28(1):107-10.